A few simple steps can help you stay cool (and safe) while moving outside this summer. When you’re used to working out in a climate-controlled fitness center or your own home, it can be tough for your body to perform similar tasks outside in the summer sunshine. To help your body adjust to the outdoor temperatures, do your first summertime workouts more slowly and less strenuously than normal. Over the next few weeks, build up the duration and intensity as your body gets used to the temperatures outdoors. Also keep these five tips in mind. 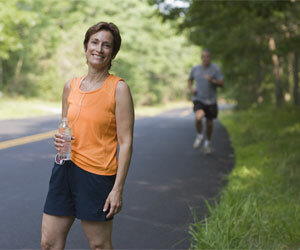 Instead of exercising at lunchtime, head out in the morning or evening, when the sun is lower in the sky. Even so, apply sunscreen with an SPF of 30 or higher about half an hour before stepping outside. On sweltering days, consider taking your workout to a shadier location, an air-conditioned fitness center (or your home), or a cool pool. Your skin needs to release excess moisture so you can stay cool. Workout clothes made from wicking materials can help. They “wick” moisture away from your body, keeping you drier and more comfortable. Look for them (including socks!) in retail stores and sporting goods shops. Choose light-colored fabrics, which absorb less heat than dark ones do. To prevent dehydration, don’t wait till you’re thirsty to stop for a drink. Instead, have some water before, during, and after your workout. When you are active, try CRYSTAL LIGHT Pure Fitness On The Go Drink Mix with electrolytes to aid hydration* and no artificial sweeteners, flavors, or preservatives. Even if you usually don’t rest during your workouts, try to schedule a few breaks when the weather is warmer. This will give you a chance to catch your breath, assess how you feel, check your blood glucose, have a snack (if necessary), and take a drink from your water bottle. If you experience the symptoms of a heat-related illness, stop exercising and get out of the heat. Weakness, headache, dizziness, muscle cramps, nausea or vomiting, and rapid heartbeat are all warning signs. If you don’t feel better after heading indoors and drinking some water, call for medical help immediately. Ask your doctor if there are any other hot-weather precautions you should take…and whether any of your medications might make you more prone to problems.